I have been of opinion quite some time that when it comes to Islam, there are no “moderates”; only reformists. If you are not a proponent of radical reforms in Islam and you call yourself a moderate, you may as well simply call yourself a hypocrite. Because orthodox Islam is in such sharp contrast with modern values of modernism and basic human rights, that trying to present it as tolerant and peaceful, which essentially negates the need for reform, is nothing but deceitful. This certainly doesn’t make the average Muslim on the street (who likely cares more about paying rent than defending doctrine) violent; but it does show why Muslim public figures trying to claim violence is not about Islam untrustworthy and opportunistic. Radicalized men for sure, but the casuistry at work here is that Hasan is lying by omission. They were not just radicalized men, but radicalized Muslims. There were plenty of people who responded with indignation and outrage at the pictures of torture by US forces in 2004; but everyone knows “radicalization” in the sense of turning to violence to settle such scores is something that happens to Muslims only. 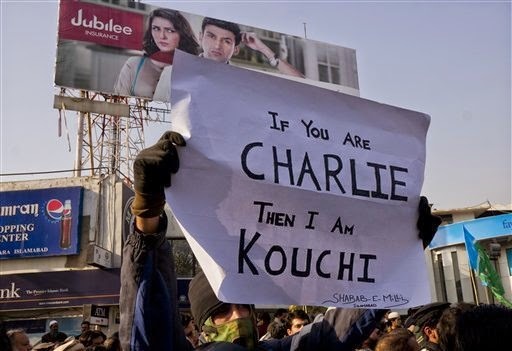 Thousands demonstrated across the world on Friday and violent clashes erupted in Niger and Pakistan as Muslims vented fury over a new Prophet Mohammed cartoon published by French magazine Charlie Hebdo. Radicalized because of “imperialism”, Mr Hasan? The post is worth writing in its entirety. Essentially what it is built around is the “Tu Queque”, aka “appeal to hypocrisy” logical fallacy, which remains as popular among the defenders of Islam as it was when I first wrote about it. It essentially goes like this: you cannot defend your position on principle, so you go after the opponent’s character, trying to show through examples of his behavior that he doesn’t actually do what he is telling you to do either (a good example being accusing Al Gore of generating too big of a carbon footprint-which, even if true, would have no bearing on the scientific validity of his claims). Given that the magazine, in addition to mocking Islam and Muhammad, also had a long record of running satirical articles and cartoons about Christianity and Jesus, Fischer raised the possibility that this attack was punishment for the magazine's repeated violation of the commandment that "you shall not take the name of the Lord your God in vain." "They made a career out of taking the name of God, the God of the Bible, the father of the Lord Jesus," said Fischer, who has made the case in the past that instituting anti-blasphemy laws in America was entirely feasible. You are not expect to have a thicker skin than Mr Fischer, Mr Hasan, just about equally as thick! It is plain that Hasan’s writing relies on more than just one type of logical fallacy. For instance, he is sheltering in the straw man fallacy when he claims “you ask us to laugh at a cartoon of the prophet”. No, no one ever said what he should or should not laugh at. I, personally, may not find the cartoons all so funny or in good taste. It doesn’t mean I should not go out of my way proclaiming solidarity with the magazine that is being silenced literally by gunfire. Because commitment to free expression means protecting speech you don’t agree with. You’d protect speech you agree with anyways; no freedom of expression needed. And besides, if Hasan dismisses the Paris attackers as “handful extremists”, what does that say about many thousands of his co-religionists in Pakistan, Lebanon, Niger, the Palestinian Territories, Jordan, Mali, etc? The latest issue of Charlie Hebdo features a cartoon of Mohammed on its cover holding a "Je Suis Charlie" (I am Charlie) sign under the headline "All is forgiven". The image has angered many Muslims as depictions of Mohammed are widely considered forbidden in Islam. Four people were killed and 45 injured in protests in Niger's second city of Zinder that turned violent with demonstrators ransacking three churches and torching the French cultural centre. A doctor in the city's hospital told AFP that all of the dead and three of the injured had gunshot wounds. There was also bloodshed in Karachi, Pakistan, where three people were injured when protesters clashed with police outside the French consulate, officials said. Among them was an AFP photographer, who was shot in the back. A police official said the violence began when authorities prevented some 350 protesters from approaching the French consulate in the sprawling metropolis. Elsewhere in Pakistan, protesters in Peshawar and Multan burnt French flags on the streets, while rallies were also held in Islamabad and Lahore. In Dakar, the capital of Senegal, police fired tear gas grenades to disperse about 1,000 protesters who chanted "Allahu Akbar" (God is Greatest) and torched a French flag. In Nouakchott in Mauritania, thousands marched chanting "We are here to defend the prophet". Some set fire to a French flag after security forces prevented them from reaching France's embassy, witnesses said. Hundreds of Palestinians demonstrated quietly in Jerusalem's flashpoint Al-Aqsa mosque compound, some with banners reading "Islam is a religion of peace!" While in Khartoum, hundreds poured out of the Grand Mosque and marched across the adjacent square, chanting "Expel the French ambassador. Victory to the Prophet of God!" Prayer leader Sheikh Mohammed Ibrahimi addressed hundreds of worshippers in Baddawi, on the outskirts of the city, saying: "May God punish this newspaper and those who back it". Protests also erupted in areas of conflict-hit Syria held by rebels and jihadists with demonstrators demanding "respect for religions", said the Syrian Observatory for Human Rights. On the Muslim weekly day of prayers, thousands flooded the streets of Bamako in response to calls by leading clerics and Mali's main Islamic body, chanting "Hands off my prophet" and "I am Muslim and I love my prophet". In Jordan's Amman, around 2,500 protesters set off from Al-Husseini mosque under tight security, holding banners that read "insulting the prophet is global terrorism". And then, we hear Hasan’s gripes about the march of solidarity with victims. Weren’t you sickened to see Benjamin Netanyahu, the prime minister of a country that was responsible for the killing of seven journalists in Gaza in 2014, attend the “unity rally” in Paris? Bibi was joined by Angela Merkel, chancellor of a country where Holocaust denial is punishable by up to five years in prison, and David Cameron, who wants to ban non-violent “extremists” committed to the “overthrow of democracy” from appearing on television. Qatar branded as "offensive" the drawing, which was reprinted by several European papers in a show of solidarity with the victims of last week's attack. "These disgraceful actions are in the interest of nobody and will only fuel hatred and anger," the foreign ministry warned. Bahrain's foreign ministry echoed that, saying publication of such cartoons "will create fertile ground for the spread of hatred and terrorism". Charlie Hebdo's latest cartoon is "disgraceful" and no more than attempt to provoke Muslims and mock their beliefs, it said. Qatar and Bahrain had sent representatives to a massive march in Paris last Sunday in support of free speech, alongside French President Francois Hollande and many other world leaders, including Muslims. Prominent among the foreign leaders marching through downtown Paris on Sunday was Turkish Prime Minister Ahmet Davutoglu, one more leader from a Muslim nation making a show of solidarity with the victims of Islamist extremism. In many ways it was a good fit: Turkey’s population is overwhelmingly Muslim, but its government is avowedly secular. The country was founded, in fact, on the principles of separation between church and state embedded in modern France, where its founding father studied. Prime Minister Ahmet Davutoğlu has strongly criticized daily Cumhuriyet for reprinting the Charlie Hebdo cartoon featuring the Prophet Muhammad, saying freedom of expression “does not grant anybody the right to insult another’s beliefs.” Cumhuriyet’s move to print a selection of Charlie Hebdo caricatures has “nothing to do with freedom of expression,” Davutoğlu said on Jan. 15. “It is obvious that people who can even take an insult against them with tolerance and patience cannot take it to the same extent when there is an insult against the Prophet. If some are printing a caricature that features an insult to the Prophet, when this is the situation, when there is such sensitivity in Turkey, then there is a provocation here,” he added. And I am supposed to be “sickened” by seeing Netanyahu at the march? I think I should be a lot more sickened by seeing the President of France shaking Davutoglu’s dirty hands. No, but Muslims are the only ones who turn violent.